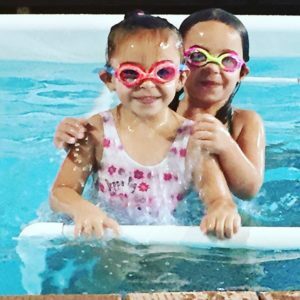 If you have a young child that’s just starting to show interest in swimming, you may be tempted to sign him or her up for private swim lessons. It’s understandable to think that private swim lessons may be superior to group lessons, but group swimming lessons have several advantages that you may be overlooking. Peer pressure is a powerful motivator, even in young children. If you’ve ever dropped your child off at daycare where he or she is exposed to other children, you likely were amazed when you picked them up only to realize that they’d learned a valuable skill like using utensils or sitting in a chair at a table, all simply based on learning from other children. jumping in the water or having fun splashing, it will likely give them that extra boost of confidence they need. This is simply not possible with private lessons where all instruction is one on one, which doesn’t allow your child to see other children and how they react in the water. 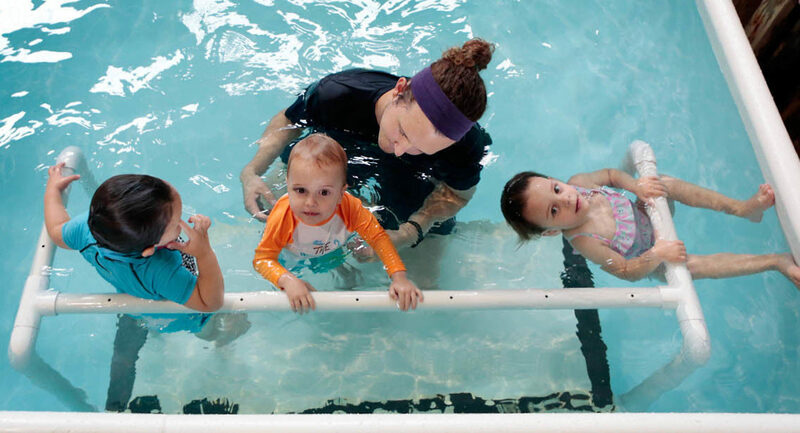 Typically swim instructors will spend time with each child during a group lesson, which allows the children in the class to see how others are performing. This can help to put your child at ease when it’s their turn with the instructor. Costs are lower with group swimming lessons. You still receive quality instruction, but at a lower price, which can make swim lessons more affordable for a wider range of families. This may seem counter-intuitive, but group swim lessons can provide less focus on your child throughout the entire lesson, which can be a good thing. Rather than spending 100 percent of the time focused on your child and your child alone, group swimming lessons allow for a bit of rest and play time while other students are receiving instruction. This is beneficial especially for young children who may have trouble with constant instruction for long periods of time. Kids who are struggling to learn a new task often need some period of downtime to recover and refocus during a swim lesson, which is what’s provided in the group setting. Being a parent of young children can be difficult at times. You’re likely exhausted and struggling to find adult interaction with other parents of young children. Signing up for group swimming lessons connects you with other parents and children who are close in age to you and your child. You never know, you may develop a relationship that could turn into a lifelong friendship for you and/or your child. Follow these tips, and it will make a major difference in your child’s progress! Regular attendance is the foundation of progress. When your child attends his/her scheduled class consistently, both the coach and swimmer are more in tune with learning, and it shows in quicker results! Practice constantly. One estimate says that it takes 100 to 150 hours of consistent, year-round instruction for a child to learn how to swim (When the depth of the water doesn’t matter). Similar to learning how to read, children develop quicker when they follow up instruction time with practice outside of class. Dream big! Do everything you can to present your swimmer with opportunities to succeed. Help them set swim goals that are unique to them. Encourage them not to worry about the progress of a friend or brother/sister. Sometimes it may seem as though your child has taken a few steps back. This is a natural part of the learning process. It is important that you remain positive and consistent, and don’t allow them to give up. Reinforce the goals that were established at the beginning of the process. Aside from promoting overall health and fitness, keeping your child swimming year round is the best way to sustain their confidence in the water and reduce the risk of drowning. Year round swimmers retain a healthy respect for water safety and build skills way beyond those of seasonal swimmers. Remember, as a swim parent, you serve a vital role in your swimmer’s success. Your attitude toward a swim program, a swim coach and your child’s attendance are all factors in their success. Learning to swim is a challenging yet rewarding investment. When it comes right down to it, learning to swim is a life skill that can actually save a life. Sometimes your child needs a little extra attention when learning a new skill, like swimming. As a parent, your first thought would be to enroll them into a private swim lesson where your child works one-on-one with an instructor. Maybe this will work for your child, or maybe it won’t. At Love Swimming, we believe that group swim lessons can be just as beneficial as private lessons. We produce the best group lessons by making sure that the student to teacher ratio is set accordingly. We believe group lessons are the way to go, and offer many benefits over private lessons! Children who are apprehensive to jump into the water can definitely benefit from group lessons! As they slowly enter into the water, feeling unsure of what this new experience will bring them, they can see their classmates doing the activities that they came to do. They can see that splashing water onto their face is not as bad as they thought it was, that blowing bubbles is possible, and that your instructor will help you while you float on your back (making sure to not let go until the child is comfortable). Group lessons take the pressure off one student, as the instructor takes turns with each kid, allowing everybody to work at their own pace. Break time: At Love Swimming, our group class size remains at 3-4 students per lesson. This creates an opportunity for each child to take a break between each skill, as the instructor focuses on another student. For an anxious swimmer, taking time to recoup during a swimming lesson is imperative for them to master each new technique. The focus isn’t always placed on one specific child, therefore, each student can take time to relax and not feel overwhelmed to constantly perform their swim skills. Sometimes more attention on one child can minimize progress or put too much pressure on them. Our group lessons allow for each child to move at their own pace. Learning from other kids: Having other children in the class for group lessons can be beneficial for your child to see what other kids their age are accomplishing in the water. Many kids are observers and like to see what is expected of them before diving in! For kids who do not like water on their face, they can see that it is okay to allow their face to get wet by observing their classmates willingly wetting their own faces. Kids are able to see other students having fun and not afraid. Our instructors approach each new student with compassion and trust to help every kid feel at ease in the water. As the instructors take turns with each child, new students are able to observe and eventually want to do what others are doing. Each student has the opportunity to watch their classmates and themselves grow – unlike being in a private lesson. 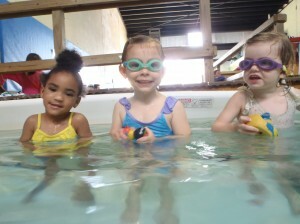 Having fun: At Love Swimming, we are constantly incorporating fun into each lesson! Our instructors want all of their students to have a fun time in the water while they are learning lifesaving skills. Love Swimming works hard to create a fun and safe environment for each swimmer. Children actually learn much more while they are having fun – so that’s what we strive to do! Your child will tell you how much fun they had and you will see their progress as they move up swim levels. Love Swimming’s group lessons can help children get over their initial fears of the water by simply having fun in the pool – as opposed to a private lesson where the focus is strictly on kids making progress alone. Don’t hesitate to sign your anxious swimmers up for group lessons today!!!!! It gives your children a schedule: This benefits everybody. Summer is great for relaxing and going on summer vacations. After a while, the kids will usually start asking for suggestions on what to do because they’re getting BORED. Maintaining an activity on the schedule helps your children know what they are doing each week and gives them something to look forward to. There is more time to practice new skills outdoors: Your family will probably take a trip to the lake, beach, or a pool this summer. While you are outdoors enjoying the sun and fun, your kids will be able to practice and improve upon those skills that are taught at Love Swimming. We all know that practice makes perfect! Repetition is key when learning any new skill. You can feed upon their natural desire to get in the water: In summer, kids are itching to get into the water. Even if your kids are too scared to go in, only dipping their toes in and splashing their feet, they still want to be in the water. So why not feed on their desire and enthusiasm and enroll them into swim lessons? Even if your children “know” how to swim, they will benefit from learning how to swim at Love Swimming. Our adult instructors are compassionate while teaching children how to swim correctly. We are here to help your kids be the best they can be! It helps keep kids safe around water: Drowning is a very real concern in the summer and year-round. The swim skills that your children learn will provide lifelong, life-saving skills that every child should know. At Love Swimming, we also teach our students water safety in and around the water! Keep on progressing: If your children are already enrolled in swim lessons at Love Swimming, don’t take a break over summer. Have fun, keep on progressing and learning new swim skills – and practice them outdoors all summer long! You can enroll today by clicking on the Enrollment page! Spring Break Water Safety Tips! Taking the kids to the beach or pool for spring break this year? Letting little ones splash and play in the water is a great way to spend some family time together, but it’s also the perfect time to get some swim practice in and strengthen water safety skills! Spend the first ten minutes practicing what your child already knows how to do in the water – whether that be blowing bubbles, floating on their backs, or kicking. Get them reacquainted with being in the water, especially if it has been a few months since y’all went for a swim. Not only should you go over your child’s swim skills, but you should remember to keep a close eye on them! That means spending some time together swimming in the pool without any sort of floatation device. Also, an important reminder: floaties are not an excuse to keep an eye off your child while they are swimming. You should ALWAYS watch them in the water. Fill a cup with water and gently pour it over your child’s head. Let them figure out how to close their eyes and mouth while the water runs over their face. This will help them become comfortable before going under the water. It is important to give your child a head’s up before dunking them under the water; a verbal cue such as, “Ready, set, go” will help them be aware of what is about to happen. If your child isn’t ready to venture out into the water, let them play on the pool steps with pool toys until they are feeling comfortable. Learning breath control in the water is also very important. Having your child practice blowing bubbles will help them ease into learning how to not drink the water. Then slowly encourage them to dip their chin, mouth, nose, then eyes in the water. Once your child is comfortable with holding their breath, then you can start working on independent floats. Grab a couple pool noodles and place them under their arms to help them learn independence in the water. They can also start practicing moving the water with their hands and kicking their feet, while on the noodle. Help your child float on their back. You can your child’s head on your shoulders and hold their hands stretched out to either side. This often helps children feel safer, rather than holding them away from your perpendicularly. Practice underwater swimming with dive rings or torpedos. Your child will love this, especially if you turn it into a game. To help your child work on their form, have them swim with their arms in the streamline position and eyes looking down. Have them float and glide on their back. This is a great way to introduce the elementary backstroke! Practice treading water. This is important in helping their core strength in the pool and sets the tone for discipline in the water. Climbing out of the pool without the help of a pool ladder. Have them grab the side of the pool, pull up and put their elbows on the deck, then push their tummy up and climb. Holding onto the wall and moving their hands along the wall to safety, as in the ladder or pool steps. Rolling over from a front float into a back float. Practice jumping into the pool, then swimming back to the wall. This skill is essential for your child’s swim safety. Spring is here! The flowers are blooming, the birds are chirping, and the kids are ready to swim! Most kids are excited about getting back into the groove of swimming, but in order to keep pools, oceans, and lakes a fun place, it is MORE important to keep them safer. Water is a hazard and is never entirely safe, hence why we need to prepare for water interaction! Even though you may not have swam in any pools during the winter or even thought about taking a dip in the ocean, the water and its potential problems are still present. These tips that we are sharing will help you and your family feel safe in AND around the water! Enrolling in a CPR class or swim lessons before you head out on your water-filled adventures would be very beneficial for your experience. Learning CPR prior to your spring break will help your mind stay at ease while your little ones are jumping in and out of the pool. You never know what may happen while your family is on vacation; it’s better to be safe than sorry! Preparing also means that your children should have proper swim lessons before taking on spring break. Formal swimming lessons reduces the risk of drowning by 88% among children ages 1-4. At Love Swimming, babies can even join the Parent Tot class as young as 6 months old! Swim lessons can help protect your children from the dangers of the water. Pack tools, not just toys. There is a false sense of security gained by parents and children who wear floaties. It is important that these devices are not replacements for life vests and are not guaranteed to protect your children. They are also not safe enough to take your eyes off your children while they are swimming. Be careful with breath-holding games. Everyone loves to see how long they can hold their breath under the water, especially when you beat your friends. But, make sure these games are held to a minimum; it doesn’t take much to go unconscious and sink in the water. If the thunder roars, go indoors. Make sure you are mindful of the weather while you’re swimming outdoors. Secure shelter before lightning strikes – you don’t want to be in the water during a lightning storm. Don’t consume alcohol around the water. Nearly 70% of water related deaths among teens and adults involved the use of alcohol. Drinking alcohol could make you less aware if you are supposed to watching your children swimming. Be safe and keep your consumption to a minimum during your spring break. Use the buddy system. NEVER swim alone or have your children swim without adults watching. Even if there is a lifeguard on duty, do not assume that your kids will be safe, especially in crowded public pools. If your child is not a strong swimmer, make sure you have them stay safe and swim within an arm’s length away from you. Always use sunscreen. Use a waterproof sunscreen with at least 15 SPF and reapply about every 2 hours. Also, it takes about 30 minutes for sunscreen to absorb into the skin. At parties: With friends and family to talk to and the busy nature of a party, it’s easy to turn your back for just a minute and stop paying attention to what is going on in the pool or beach. How to stay safer: Designate one specific adult to keep an eye on the kids and rotate the duty during parties or get-togethers. Crowded pools and beaches: It’s hard enough to keep your eyes on your children when it’s just them; add in a few dozen more and their parents and it can be very easy to lose sight of what your child is doing. How to stay safer: Make sure your children take swim lessons even if they “know” how to swim – and always have kids swim with a buddy to keep an eye on each other. Most important, make sure you recognize the signs of drowning and know what to do in an emergency. Unknown water: Part of the fun of summer is going to pool parties, going fishing, and heading to the beach for the weekend! You could end up dipping your toes in unfamiliar water (literally). But do you know the potential hazards? How to stay safer: The feeling of being in the ocean can be incredible, but waves are constantly crashing, unlike a pool. This makes it hard to see everything that is going on in the water. Always know the water that you are going to swim in. Check out the depth, sea life and creatures in your surroundings; also, make sure you pay attention to the lifeguard signs and warning notices. Teach kids water safety skills to help them become better swimmers! Open pools: Everybody loves playing in the water, especially kids. That means sometimes they may not pay attention to when they’re not supposed to jump in the pool. How to stay safer: If you have a pool in your backyard, install a fence around and keep it locked. Also, remove the ladder whenever the pool is not in use. Cover the pool when practical. Pool drains: Even though you can see what is in the pool, as opposed to being at the lake or ocean, there can still be hidden dangers in an indoor or outdoor pool. How to stay safer: Be cautious of the power and suction of drains. Maintain the pool properly and install a new, safe drain to prevent from getting caught. Also, consider modernizing the drain system or installing a sensor. You should also be careful when wearing having fun and wearing a mermaid fin. Deep water: Whether jumping off the diving board into the deep-end of the pool or running into an unknown depth of the ocean or a lake, it’s even more important to know how to swim and utilize important water safety skills. How to stay safer: Consider purchasing some U.S. Coast Guard approved floatation devices, and know when the proper time for kids to wear lifejackets. If you’re out on the water, riding on a boat with your friends, know what to do during an emergency situation. Love Swimming helps keep children safe in/around the water!! Enjoy your spring break and make sure your children are prepared to have a fun and safe time! Enroll in year-round swim lessons at Love Swimming your mind at ease when you’re on vacation. We’re here to help keep your little ones safe! Every parent knows that swimming is a crucial life skill that their children NEED to learn. However, if a child shows resistance, it can be difficult for both the child and their parents. Many families struggle through swim lessons, but we are here to say that it will be okay!! These comments are all too common when you are dealing with a child who is unwilling to go near the pool. Parents/guardians endure the screaming and crying as they walk their first-time swimmers up the stairs. Children can be stubborn! Even if parents have made their own attempts at getting their kids in the water, it can be a never ending battle to get them comfortable in the water. Swimming is a life skill, and many parents feel strongly towards their children learning how to swim. This is where our Love Swimming instructors step in. Our staff is here to take your little ones on, and will endure what feels like the impossible! I know that it sounds crazy to hand your toddler off to a complete stranger and hiding out of plain sight. It is difficult knowing that your child is crying and looking for mom/dad while the instructor is teaching them unfamiliar skills. Letting the swim instructors teach your children for 30 minutes while your child is frantically trying to find a way out of the pool, can easily be the hardest part for parents to watch and hear; however, it is essential for your child. Breed familiarity: When you arrive for your child’s first swim lesson and they’re crying hysterically, it can be agony. It can also feel embarrassing; it seems like the tears and screams are endless. Know that you are not alone and that this won’t last forever. For most children, a pool is daunting. Children can also become fearful when they are expected to go off with an instructor, whom they are unfamiliar with. Don’t forget, our instructors train for these moments and we will get your child swimming! But, there are things that you can do to help before your child’s first lesson. Visit our facility and meet the team! Show your kids the pools and prepare them for what to expect in swim lessons. Then, walk your child to their first lesson, and enthusiastically greet the teacher. If you trust us, your child will too! Building familiarity can reduce fear. Try to remain positive: If you dread swim lessons, then your child will too. If you exude negativity or worry towards swim lessons, again, your child will too. Talk positively about the instructors, the pool, and the swim school. Remain calm and upbeat, and cheer your child on during the lesson, even when both of you are nervous/scared. As a parent, you have to make sure that you push your children out of their comfort zone and build confidence. Hugs and high fives go a long way to reassure children. Be the parent: Your child is going to tell you that they don’t want to swim. They will probably also tell you that they don’t want to eat their vegetables, go to sleep, or go to school. As a parent, certain things have to be non-negotiable, especially when it comes to your child’s safety. So, when they start putting up a fight against going to swim lessons, just remember #1 and #2 above. They might be mad at you now, but they will be happy in the long run. Commit the time: Mastering swim skills take time. All children are different, and some may need more time in swim lessons to execute the proper skills. Swimming requires persistence and practice. Doing the doggy paddle to the side of the pool is not swimming. It’s not even keeping your child safe. Commit the time to make sure that your child learns how to swim efficiently, properly, and skillfully. If you pull your child out of swim lessons before they move onto the next swim level, then they’re not ready for the water. Children should stay enrolled in swim lessons longer than six weeks; make sure you place swim lessons above other frivolous hobbies. Something is wrong when we don’t place enough emphasis on a life skill. Practice, practice, practice: The more you practice the skills we teach your child, the faster they will learn and be able to graduate from our program. Try to take your children to the pool outside of swim lessons; practice what we teach your children. Practice blowing bubbles and getting their face wet in the bath tub. When you devote the time and energy into helping your kids learn how to swim, you are helping to foster independence and confidence within your children. When Summer is over, many families discontinue swim lessons in favor of soccer, football, piano, or guitar. According to the CDC, drowning is the leading cause of accidental death in 1-4 year-olds, and the second leading cause of death in 5-9 year olds. But formal swim lessons reduce the risk of drowning by 88%. Safety: Little swimmers who break during the fall and winter months not only lose swimming skills, but they can also forget crucial water survival and safety skills. Without repetition, these skills leave a child’s long-term memory and, when faced with a life-threatening situation, it is more likely that a child who has stopped lessons will forget what to do when it matters most. Skill Progression (and Retention): We’ve all heard the saying “If you don’t use it, you lose it,” right? It’s true. In order to retain skills for the long-term, students must continue to swim beyond the summer months. Love Swimming coaches see it all the time: a child has advanced to a particular level over the summer only to leave in the fall and regress to the previous level when re-enrolling the next summer. The longer a child is away from swimming, the longer it takes him or her to work back to the initial skill level. Health: We hear it all the time: “We are stopping when the weather turns cooler because getting wet and going from hot to cold environments will make him/her sick.” The truth is, children who spend fall and winter months swimming are not more susceptible to colds and viruses. Our warm (90 degree) hygienic saltwater pools ensure that your children’s body temperatures stay constant. In addition, research has shown that swimming keep lungs clear of accumulated mucus, reducing proneness to respiratory problems. Finally, swimming (and other physical activities) increases appetite and improves sleep patterns which can contribute to increased immunity against winter illnesses. Brain Building: Science has proven that practice does, indeed, make perfect. Brain imaging technology allows us to see how the repetition of actions affects the brain’s make-up. In order to perform a task, various parts of our brain are activated and create electrical signals to engage other parts of the brain. The faster these signals can transmit, the more “automatic” the task becomes. Transmission becomes faster through myelination. Regularly practicing a skill like swimming causes the same pattern of electrical signals to activate which, in turn, triggers the myelination of this transmission system. This is how you build aptitude, speed, and enhance procedural memory for a specific skill. It is common sense that has been scientifically proven: the more you do something, the better you get at it and the more automatic it becomes. By enrolling your child in year-round swimming lessons, your child perfects strokes, gets faster, and advances to the next class level. More importantly, it means that at any time, in any season, your child will be more likely to remember and implement the life-saving skills he or she has learned when around water. ***An exclusive offer for Love Swimming members! Come add some bubbles to your day!